Our Aroma Mists are a multi purpose product. They can be used as a room freshener, a body spray, or as a linen spray. The Aroma Cleanse & Clean as a Whistle both have antibacterial properties making them also ideal for surface use. 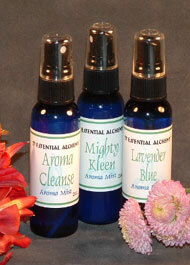 These are our Aroma Mists with blended essential oils. Scroll down for more, with single notes. Blended in spring water with a natural coconut emulsifier. No alcohol is used. Some essential oils smell just right by themselves... single note Aroma Mists.